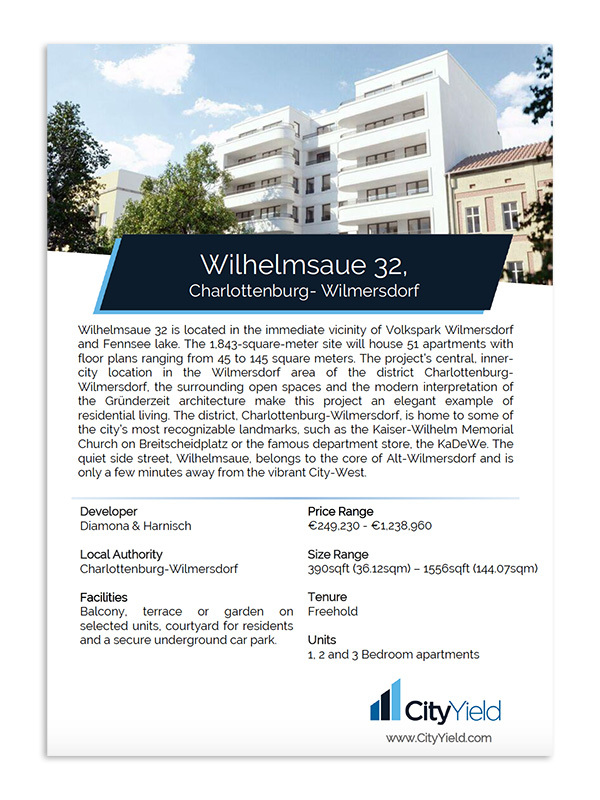 Wilhelmsaue 32 is located in the immediate vicinity of Volkspark Wilmersdorf and Fennsee lake. The 1,843-square-meter site will house 51 apartments with floor plans ranging from 45 to 145 square meters. The project’s central, inner-city location in the Wilmersdorf area of the district Charlottenburg-Wilmersdorf, the surrounding open spaces and the modern interpretation of the Gründerzeit architecture make this project an elegant example of residential living. The district, Charlottenburg-Wilmersdorf, is home to some of the city’s most recognizable landmarks, such as the Kaiser-Wilhelm Memorial Church on Breitscheidplatz or the famous department store, the KaDeWe. The quiet side street, Wilhelmsaue, belongs to the core of Alt-Wilmersdorf and is only a few minutes away from the vibrant City-West. * Download the brochure to learn more.